Description: Work train. Canby siding. 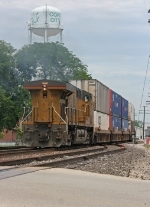 Description: UP Eastbound Produce Train ( CSX Q090 ) in the evening hours at Rochelle with UP 5317, UP 5316, & UP 5314. Description: two WBs in 10 minutes! Description: A heavily powered grain train is out of Galva and now meeting an autorack at Galva siding. The CASE backhoe has been used in track maintenance going on. Description: Northbound DPU's out of council bluffs. Picture taken by my wife at 70 mph on the interstate. She was not driving. Description: UP AC45CCTE 5317 leading a north-bound train out of the yard towards Atlanta or Birmingham. Description: UP 5430s DPU unit, there was an eastbound that I took video of in poor light that had closely numbered UP 5315 as DPU. Description: A total of eight unit (2 on point; 5 mid and 1 aft) move this train to the west on UP Huntington Sub.